Toyota said it plans to begin testing the e‐Palette concept vehicle in various regions. 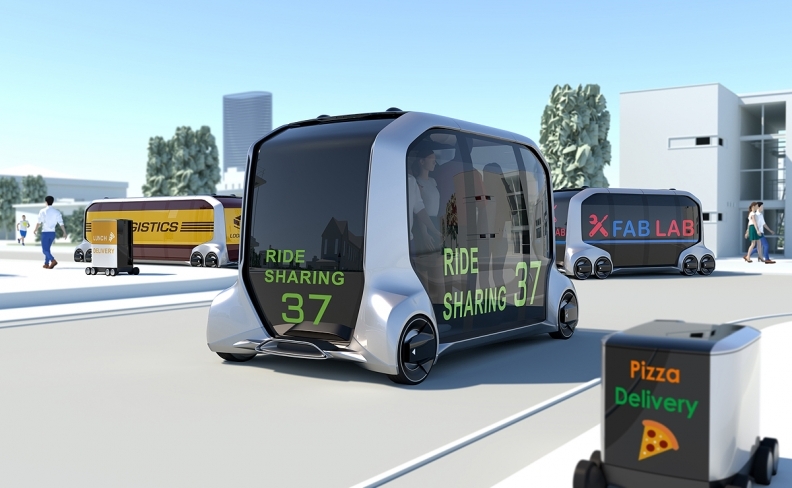 LAS VEGAS -- Toyota Motor showed off a self-driving electric concept vehicle that it will tailor for companies to use for tasks like ride hailing and package delivery, underscoring how automakers are no longer simply building cars but also providing services to go with them. The automaker said it plans to begin testing the e‐Palette concept vehicle in various regions, including the United States, in the early 2020s. It will come in three sizes: a bus-sized vehicle, a shuttle and a small delivery vehicle sized to run on sidewalks. Toyota said at the CES global technology conference in Las Vegas that it will work with companies including Amazon.com, Chinese ride-hailing company Didi Chuxing Technology, Pizza Hut, Mazda Motor and Uber Technologies to build the vehicle and its hardware and software support and develop connected mobility products. After intense r&d in self-driving technology, automakers are beginning to unveil clearly defined autonomous vehicle strategies and looking to apply the technology to uses like ride services, shuttle services and package deliveries. Toyota took longer than rivals to warm to the idea of autonomous vehicles, but has committed $1 billion through 2020 to develop advanced automated driving and artificial intelligence technology. It plans to begin testing cars that can drive themselves on highways around 2020. "This announcement marks a major step forward in our evolution towards sustainable mobility, demonstrating our continued expansion beyond traditional cars and trucks to the creation of new values including services for customers," Toyota President Akio Toyoda said in a statement. The vehicle features an open control interface enabling Toyota's partner companies to install their own automated driving system. Toyota's so-called "guardian" technology will then act as a safety net, the company said. Carmakers, tech companies and other service providers have partnered on self-driving projects over past two years, due to the difficulty and high cost of developing such technology alone.